The Mid-Century Shaving Scuttle is one of the best shaving scuttles today, sporting an ergonomic design that makes it easy to use. This scuttle keeps lather warm throughout the whole shaving session. Use hot water from your tap to form lather and expect it to be kept warm while you shave. Inside the bowl, there is a patterned texture, which allows you to build lather easily. When creating lather, you will only need to whip a few times and you are good to go. The bowl is made of ceramic, which enhances its productive life. Ceramic also retains heat, keeping your lather warm for a long time. With this scuttle, you no longer need to use a small shaving mug or tin. It offers enough room to create lather without worrying it will drip from the sides. After use, you can clean this brush in your dishwasher. It is fitted with a large handle, making it easy to hold. 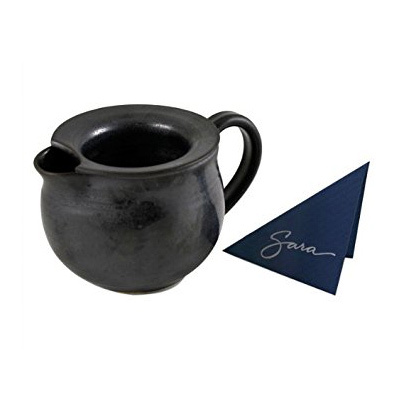 Note: The Mid-Century Shaving Scuttle is currently unavailable but you can take a look at this Georgetown Pottery G20 Shaving Scuttle Mug that features a similar design. The Crown King Shaving Scuttle sports the same design as the Mid-Century Shaving Scuttle. It has enough room, allowing you to create lather and keep it warm. Each unit is created from long lasting porcelain. This heirloom quality scuttle has interior vertical digs that facilitate lather production. Granted, you can produce lather in a few seconds with a good brush. Each unit holds up to 12 ounces of lather, which makes it a suitable bowl for professional use. Each bowl includes rot resistant silicone stopper and a cork stopper. The scuttle has an innovative design that lets you experience an exceptional shave. Its white color with a smooth surface makes it easy to clean. It is dishwasher friendly for easy cleaning. Its large handle accommodates different grips and reduces the chances of burning. 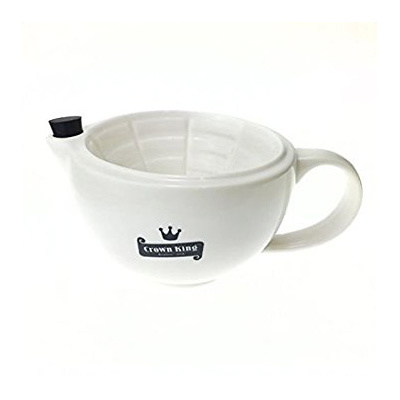 Note: The Crown King Shaving Scuttle is currently unavailable but you can take a look at this QSHAVE Shaving Scuttle Mug that features a similar design. The Sara Bonnyman Pottery Large Slate Moss Scuttle is an artistic handmade shave bowl and one of the best shaving scuttles on our list. Different pieces have unique variations. The inconsistencies seen in the finish on these scuttles make them appealing. If you love handmade bowls, this might appeal to you. This unit is offered with a curved design and a small spout at the top, allowing you to pour out lather after shaving. This is a large shaving scuttle, allowing you to create enough lather for more than a single shave. This makes it suitable for professional barbers. The smoothness of each unit makes the cleaning process easy. The bowls are created in different colors. This scuttle is relatively costly, costing up to three times the price of other scuttles. However, it is large and long lasting. The scuttles are made of porcelain for durability. The Schone Stainless Steel Shaving Scuttle Bowl is a simple bowl designed for budget buyers. You should consider it when you are looking for a simple bowl, for lathering and keeping lather warm. Unlike porcelain and ceramic scuttles, this unit loses heat relatively fast. The bowl is made of stainless steel; it is a suitable unit for wet shavers, but can be used for a horde of other purposes. Its beautiful polishing gives it a great look. It fits standard 3-inch shaving soaps. It is dishwasher friendly. 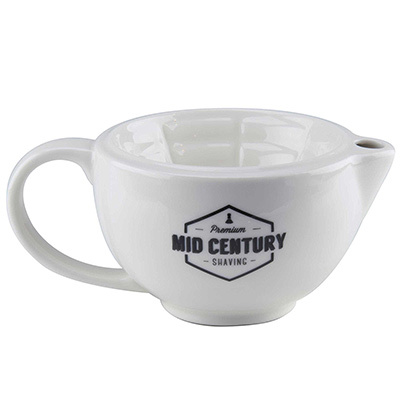 The double layer construction of this bowl keeps it insulated, enhancing its heat retention. Interior surface is, however, smooth, and you might need a couple more minutes to make lather. Like most bowls on the market, it does not feature a spout and a handle. The unit feels sturdy during use; you can use it in any condition. The Schone Stainless Steel Shaving Bowl sports an attractive design that appeals to a high number of people. 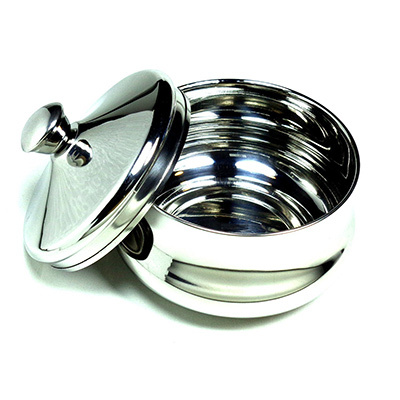 It is a stainless steel bowl with a lid to lock in heat and keep the lather warm. It is designed to hold different brands of shave soap, making it a versatile unit for all shavers. Its strong construction enhances its durability while its polished finish makes it easy to clean. 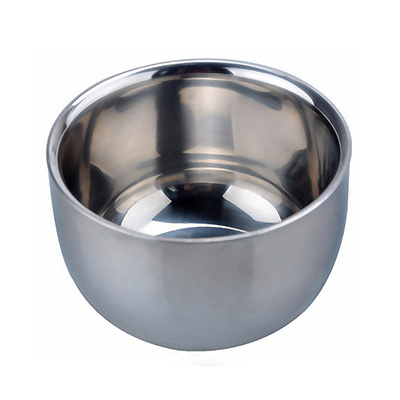 Unlike other units that are chrome plated, the Schone Stainless Steel Shaving Bowl will not peel or flake. You will only need to wipe the bowl and the lid to keep them clean after shaving. Each bowl is gift wrapped, making it a suitable gift item. Its price is relatively low which is why we consider it to be one of the best shaving scuttles for those that are looking for an affordable option. Recommended read: Now that you know what the best shaving scuttles are, you may want to take a look at our article on the best shaving brushes you can use for traditional shaving. Scuttles and bowls are a necessity when you are shaving wet, so you need the best shaving scuttles possible. Scuttles were meant to keep water warm and are also used to lather creams and soaps. They are chosen based on their construction material, their price-performance ratio, ease of cleaning, and ease of lathering, features which were discussed in our article. What’s your experience with shaving scuttles and bowls?